This raspberry bread recipe comes together in about an hour like most quick breads and can be ready for your afternoon cup of tea. 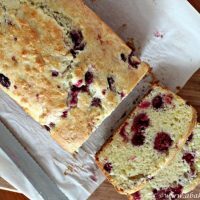 Fresh raspberries or frozen raspberries may be used in this bread recipe and they add a sweetness and color that make this a recipe to keep handy. Quick bread are breads that rise with an ingredient other than yeast. Baking soda or baking powder are the ingredients that often create the leavening or volume in this type of baking. The quick bread doesn’t require a resting time to rise in the way a yeast bread would. It must be baked quickly (hence, its name!). Once the baking soda or baking powder starts to do its thing in the batter, you’ll want to get the bread batter into the oven. You are likely very familiar with some quick breads like banana bread, pumpkin bread, scones, and most muffins. What berries are good for baking bread? Nearly any berry would be lovely in this bread. I used frozen raspberries for this raspberry quick bread, but blueberries, cranberries or cherries would all work. This cherry bread recipe makes the most out of frozen cherries too! Can you bake with frozen berries? Yes, you can bake with frozen berries. Frozen berries add more moisture to the dough and you may need to add a few minutes to the baking time for your quick bread recipe. Sometimes heavier berries like cherries and raspberries may sink to the bottom of your dough. You can dust them with flour before adding them to the batter. This trick may be used with fresh or frozen berries. How do you make raspberry bread? Mix the dry ingredients, set aside. Use an electric mixer to blend the wet ingredients. Toss the raspberries with flour and add them to the batter. Bake for about an hour or until the top is lightly golden. This quick bread recipe includes sour cream, eggs and oil in the ingredient list which make for a rich, moist bread. Be careful not to over mix the bread batter. Just blend until the dry ingredients are barely still visible. You can make raspberry muffins with this recipe too! Simply shorten the baking time to 22-24 minutes. In recent months I’ve taken Twelve Loaves as a chance and challenge to myself to bake yeast breads. But #TwelveLoaves is about more than yeast, any bread is welcome—quick breads, bagels, scones, and more. Preheat oven to 350 degrees F. Grease a loaf pan with baking spray. Mix 2 cups of flour, 1/2 cup sugar, baking powder, and salt in one bowl. In a separate bowl combine the sour cream, milk, vegetable oil and eggs. Add the wet ingredients to the dry ingredients. Mix until just combined. Gently toss 2 Tablespoons of flour with the frozen berries. Add them to the batter. Pour the batter into the prepared pan. Bake for 55-60 minutes. 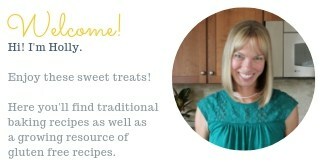 How time flies from month to month when I am baking with my #TwelveLoaves friends! Join with us and bake along with April’s theme: BERRIES! Lora at Cake Duchess leads this baking group by providing a theme and sharing the link up. It is so much fun to see how similar ingredients used in many different kitchens can create such a wide variety of goodness. Bake bread with berries this month and add your creation to the group list below. We’d love to have you along! #TwelveLoaves April: Berries. Bake a bread, yeast or quick bread, loaf or individual. This #TwelveLoaves is all about incredible breads with berries featured in April. Do you have a favorite berry bread? We would love to see it. Let’s get baking! Look at what our very talented #TwelveLoaves bakers have created this April! Originally published in 2013. Updated in 2018. Yummm!!! Love this bread with raspberries! I must try this! Looks delicious and lovely! How beautiful is this?! It just so happens that I have a couple of packages of frozen raspberries on hand. I guess I know now what I need to do with them. Lovely photos Holly. Although I love it when I have the time to make a wonderful yeast bread; those times are few and far between and quick breads are more often coming from my kitchen. This one is so pretty and the flavors sound divine. I concur with Karen…lovely photos Holly! This bread is beautiful! I have a strong desire for raspberries and I cannot wait for things to warm up around here! That means berry time! I have made so few quick breads but I think you have inspired me to try a few. I wouldn’t mind branching out from the yeast breads I usually bake. Thank you for this delicious inspiration! Now how did you know I had a bag of frozen berries in my freezer that I needed to use? Thank you SO much for sharing this recipe! I bet the sour cream makes this bread moist and delectable! 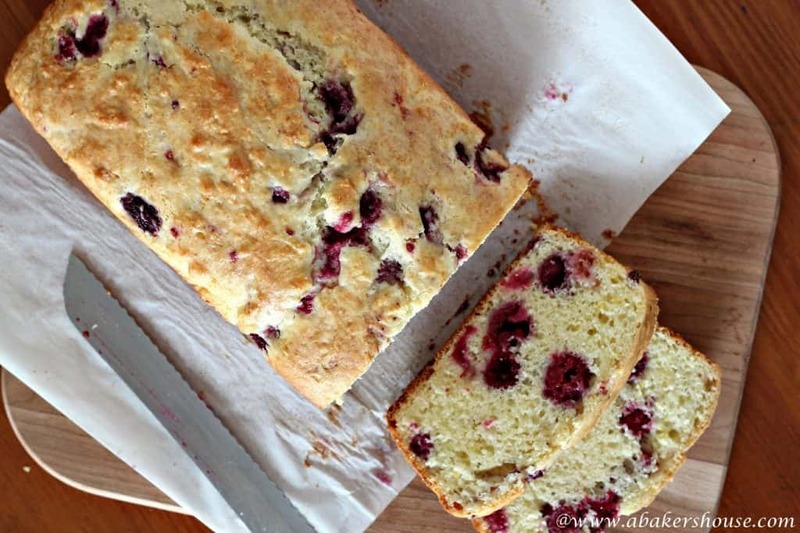 I love that frozen berries work well in your delicious bread! Your bread turned out so beautiful. Love baking with berries. Can’y wait to try your version! This. Looks. Fabulous. I love it, Holly! I need to get some raspberries now so I can make this! The raspberries look so pretty baked in this bread! It sounds delicious! Quick breads are one thing I feel confident about baking. This looks delicious Holly, and thanks for another recipe I can add to my database. That is such gorgeous looking bread, it sounds delicious too! 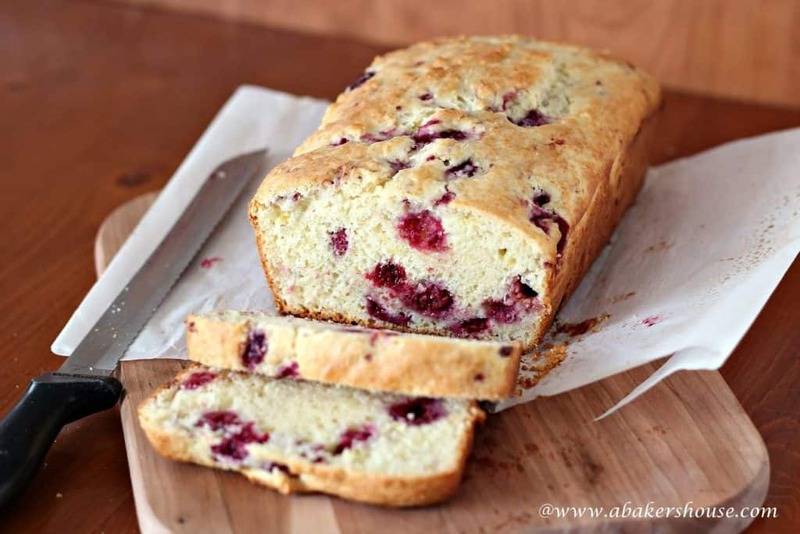 Yum, raspberry bread sounds amazing, what a great idea! Love it!We did this recipe for the first time today and although we may have slightly over baked it, it still tastes awesome. Thanks for taking the time to leave a comment letting me know that you made this bread today– I am thrilled it tastes great! Now you’ve brought it fresh to my mind too and I may make it this weekend. Thanks!